Not only more meaningful content, but also comprehensive research functionality leads users quickly and easily to information. 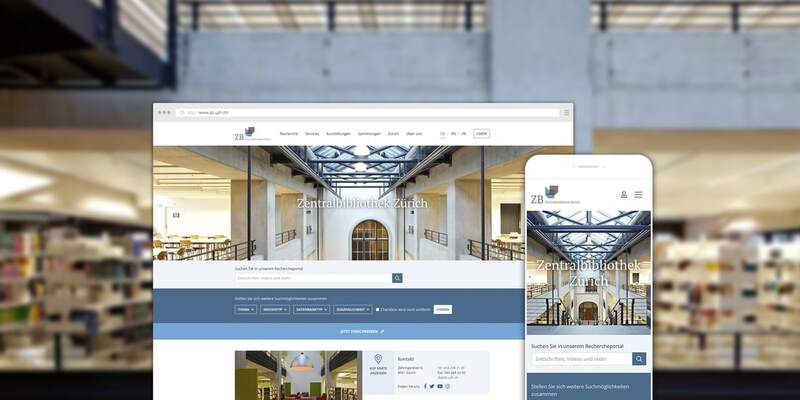 The new Zentralbibliothek website website speaks for itself. The relaunch project for the Zentralbibliothek (ZB) library in Zurich has been great fun for us, and has been educational, exciting and diverse all the way from the planning phase to implementation. The planning phase started with a joint workshop where the project strategy was defined and the requirements for the website’s functionalities as well as a draft for the information architecture were discussed. Using what we learnt at this workshop, we began consulting the ZB and started implementing the user-oriented design. The result was a navigation concept with an improved user experience. Thanks to the various different access levels, all target groups have access to the content they need. In addition, the website’s content was completely redesigned and rewritten to take the new concept into account. Thanks to the development of a content strategy and the subsequent creation of a content guide, the new website’s layout is user-centric. Users want to experience the website’s content, so content experts, design experts and software experts all worked together to create the most optimal user interface. The library's employees were helped with editing and trained in the new editorial processes. The main idea was to provide comprehensive and easily accessible search functionalities for users. The search portal, technically implemented using CMS October, is the main feature of the new website. The agile working methods employed enabled us to achieve the best possible result. The ZB uses Google Tag Manager and Google Analytics to comprehensively analyse its new website. These tools also provide employees in the communication department with measures to determine how to optimise their marketing activities. To aid this optimisation, we first ensured that they had the technical standards needed for SEO. ZB employees have also become experts in the continued use of these analysis tools thanks to coaching and training sessions. We worked well together throughout the project thanks to open communication and numerous exchanges. Existing structures could be broken down and redesigned. A new focus on being user-centric could be implemented both technically and in terms of content as we made use of new approaches for both our collaboration and the implementation of the project. From a technical perspective, we prefer open over closed. This is why we used open source and opted to work with October’s CMS platform and Google’s Analytics infrastructure. The technical management of the new website will be taken over in full by the ZB’s IT department, which meant that we needed to pass on some of our expertise in the field. We also trained the employees of the communication department in how to keep the content of the website open and how to redesign it. Liip has helped us very well to think less 'from the inside', from the logic of our organisation, and more from the point of view of our customers. This opened up a new perspective for us, and we managed to communicate our content in a fresh, straightforward way. We are very happy that, thanks to our collaboration with Liip, our new website is designed to meet the needs of our users. Working together in a strong team, we have overcome a real challenge and are proud to present our work for the ZB.